Also I'm not sure if these come with the two pin plugs either. Comes with someone else's face sweat, completely gratis! Sony US are cutting the price again. Eu to follow? I've already got the camera and move controllers... and free games from PlayStation plus... tempting!!! Suspect it will be an EU plug but that's ok adapters are cheap. Just make sure you don't use a 2 amp shaver adapter. Look across al Amazon Warehouse European sites, they vary in price. I got one from France for £135, it was all sealed just the very outer box missing. Hello hello hello!Suspect it will be an EU plug but that's ok adapters are …Hello hello hello!Suspect it will be an EU plug but that's ok adapters are cheap. Just make sure you don't use a 2 amp shaver adapter. Careful getting second hand PSVR's - you have no idea of the state of the non-replacable lenses. Euro plugs and British shaver plugs look similar but are not. Pins have a different diameter and spacing. Euro plugs will fit in a shaver socket but will be loose as pins are 4mm as opposed to 5 mm on a shaver. I wouldn't have thought it would provide enough amperage tbh as it was intended for a low wattage device. Although admittedly i dont know if the power rating as it were of the psvr exceeds 2 amp? I know you can just swap out the power cable for the ps4 itself if you grabbed a ps4 from the states or the eu and want to use it in the uk but not sure you can do that with the psvr. The psvr has a psu adapter that plugs into the unit where all the wires go, the adapter has a figure 8 type cable to the adapter, so perhaps a UK plugged figure 8 cable will do the trick to the PSU. I bought a PSVR headset on black friday, brand new etc, it worked for 3 hours, after moaning at Amazon, they gave me a £40 gift voucher and sent me a replacement 2 days later and collected the broken unit, not bad £210 with skyrim and the psvr room voucher with the camera. I wouldn't have thought it would provide enough amperage tbh as it was …I wouldn't have thought it would provide enough amperage tbh as it was intended for a low wattage device. Although admittedly i dont know if the power rating as it were of the psvr exceeds 2 amp? I know you can just swap out the power cable for the ps4 itself if you grabbed a ps4 from the states or the eu and want to use it in the uk but not sure you can do that with the psvr. PSVR adapter is 36w, 3A -12v so probably about 0.2A from mains. ah, i came a cropper once so now hate on shaver adapters probably more than i should. ah, i came a cropper once so now hate on shaver adapters probably more …ah, i came a cropper once so now hate on shaver adapters probably more than i should. Nah your original statement is still correct mate. As I said before shavers and euro plugs are not the same dimensions. yep we talked about it above. I've already got the camera and move controllers... and free games from …I've already got the camera and move controllers... and free games from PlayStation plus... tempting!!! Bugger never thought to download the free VR games for when I get one, what a numpty! Bugger never thought to download the free VR games for when I get one, …Bugger never thought to download the free VR games for when I get one, what a numpty! Two of them are still available on PS+ as far as I know. Bought! Thanks. Also, importing Summer Lesson from Japan. Just signed divorce papers for my wife. Don't need a real woman now that I will have a virtual one. Don't need a real woman now that I will have a virtual one. One that is a schoolchild, that you have to tutor? Not dodgey at all, huh? Hope so as started to get tempted seeing all these deals on here. Incoming price drop in the UK? 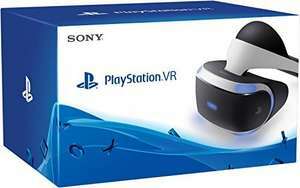 why is the italian and other eu states prices for the psvr around the £199 price point in the first place ? What's the difference between 'V1' and the other versions out there (assuming a V2)? Signed in with my UK Account which has Prime but its not seeing it? Stores have already done this - Sony did a countrywide price drop of two V1 bundles to £249 over Black Friday weekend. Offer was supposed to last until 27/11, but stock was gone in a couple of days. I doubt very many if any are left in the stores. New bundles, including the V2 headset, were released at the begining of December for an RRP of £349 but are generally selling at £299 including the headset, a game and camera. For £349 you get the Move controllers thrown in. What's the difference between 'V1' and the other versions out there …What's the difference between 'V1' and the other versions out there (assuming a V2)? Not much. The newer V2 headset is slightly redesigned to have the earbuds and swtiches built in, rather than on the connecting cables and therefore also slightly designed different connectors / cable. The main difference is the V2 processor box supports HDR pass thru which the old V1 didn't. Your PS4 HDMI output goes into the PSVR processor box (which the headset plugs into) and then another HDMI goes from the processor to the TV. When not using the PSVR, the signal still goes through the PSVR box but doesn't pass HDR so, if you have a TV which supported it, you have to unplug the cable from the PSVR and back into the PS4. Or... like me, you can just buy a switch box for less than £15. There are no visual differences between using a V1 or V2 headset. There are small improvements if you use either headset with a PS4 Pro rather than a "standard" PS4. I picked one of these up from Amazon Italy.. Posted yesterday from the UK and with Hermes for delivery today. The little processing box on the v1 doesn't support 4k or HDR so if you have a ps4 pro and 4k TV you can't leave this plugged in if you want to play 4k HDR games. Also I believe v2 comes with headphones built into the unit.